If you're upgrading your PC for virtual reality before mid-June, this promotion gives you three free games to start with. We've seen several deals and giveaways for virtual-reality headsets in recent months, but those mostly involved the HTC Vive. 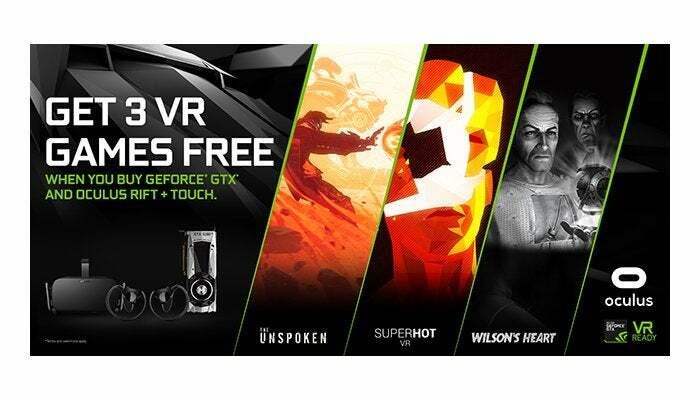 This time around, Nvidia and Oculus have teamed up for a Rift-flavored deal: Currently, if you buy a select GeForce GTX 10 Series card and the Oculus Rift + Touch, you'll three VR games for free. The deal began on April 25 and lasts until Tuesday, June 13, 2017, or while supplies last. Nvidia says both Newegg and Amazon have this deal. However, while Newegg definitely offers the deal as described by Nvidia, Amazon seems to limit you to specific, preset bundles. Nvidia's eligible graphics cards include the GTX 1080 Ti, GTX 1080, GTX 1070, and GTX 1060. The offer covers buying the cards separately, as part of a system, or built into a laptop. The free games include one of our personal favorites: Superhot. We reviewed this surreal, time-warping shooter in its traditional PC form, but I can only imagine it's great in VR, too. The second game is Twisted Pixel's Wilson's Heart, which we said "feels like the first 'can't miss' VR Game." Lastly, Insomiac's spell-casting fighter, The Unspoken, is included.